The IAP Secretariat will arrange the initial hearing for the taking of all of the Claimant’s evidence. The Claimant will answer all questions put by the adjudicator. Based on the Claimant’s evidence, the adjudicator will make an assessment of credibility and determine whether there is a prima facie basis to support a claim within the complex track. If a prima facie basis to support a claim within the complex track is not made out, then the claim will continue (in the same hearing) under the standard track unless the only allegation in the claim is in the Other Wrongful Act category in which case the claim will not proceed. If a prima facie basis to support a claim within the complex track is made out, then the adjudicator shall arrange for expert assessments required by the standards set in the IAP. The IAP Secretariat will also make arrangements for hearing the evidence of any witness in relation to the claim or any alleged perpetrator. On the receipt of expert and/or medical evidence or at any point if such have been waived, the government and the Claimant may attempt to settle the claim having regard to the available evidence, the preliminary assessment of credibility, and all other evidence. If attempts to settle are not made, or if attempts are unsuccessful, then the claim will proceed to conclusion and decision, including recalling the claimant if appropriate circumstances exist. It is intended that this direction, or any interpretation of it, should not detract from any procedural or substantive rights of a claimant or other party that are provided in the IAP. Cases will flow smoothly through the entire IAP. Every case ready for hearing, whether in the standard or complex track, will first proceed with the claimant’s evidence. If it turns out that a complex issues track claim should have proceeded under the standard track, it can move in that direction immediately after the claimant’s evidence without the need to recall the claimant or have another hearing. In many cases the parties will only have to get together once, for the claimant’s evidence, rather than for a preliminary assessment hearing and a final hearing later. This will avoid unnecessary delays due to scheduling of two hearings instead of one. Benefits of this include less time to the conclusion of a case, lower cost hearings, and less potential to re-victimize the claimant. 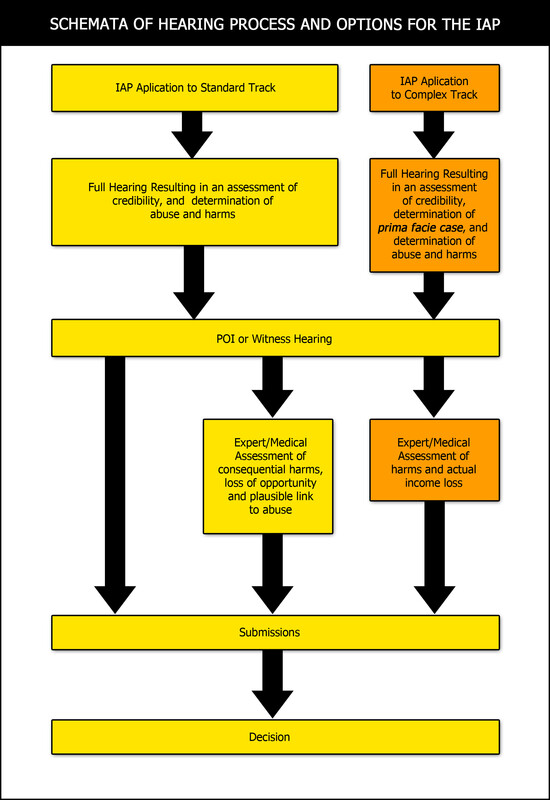 The process avoids the unnecessary delays that might result from new or more detailed disclosures of abuses or harms late in the process at the second hearing. The process allows for witness and POI testimony to proceed without having to wait for the second hearing with the claimant, which second hearing occurs later in the process under the current b.viii. Adjudicators will have detailed evidence with which to assess the claim and on which to instruct experts. Preparation of directions to experts will take less time and will therefore be less costly. Experts will make their assessments based on detailed evidence. Expert assessments will likely take less time because the expert will already have detailed information from the transcript. Directions to the experts will, therefore, be based on concrete evidence already heard rather than possibilities. This process results in a proper record of all proceedings, thereby meeting the procedural fairness requirements in administrative law. The proposed process will result in all claimants’ having a right of review under the IAP. The hearing process will be completely transparent and the risk of inconsistencies will be greatly reduced. In addition, a pre-hearing management conference (normally by conference call) is contemplated to allow the parties and the adjudicator to assess the readiness of the claim to proceed in the complex track. Overall, this amendment will maintain the spirit and intent of the complex issues track provisions while at the same time creating a more streamlined, more sensitive, timelier, and less costly process. Attached as Appendix “A” is a graphic illustration of the proposed process.